Story: It is a dark time as the Age of Piracy nears to a close. Lord Cutler Beckett of the East India Company has gained control of the terrifying ghost ship, the Flying Dutchman, and its malevolent, vengeful Captain, Davy Jones. The Dutchman now roams the seven seas, unstoppable, destroying pirate ships without mercy, under the command of Admiral Norrington. 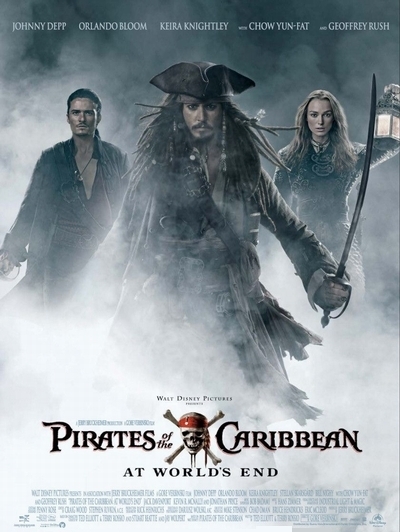 Will Turner, Elizabeth Swann and Captain Barbossa embark on a desperate quest to gather the Nine Lords of the Brethren Court, their only hope to defeat Beckett, the Flying Dutchman, and his Armada. But one of the Lords is missing - Captain Jack Sparrow, either the best or worst pirate ever, and now trapped in Davy Jones Locker, thanks to his encounter with the monstrous Kraken. In an increasingly shaky alliance, our heroes, including Tia Dalma, Pintel and Ragetti must first travel to dangerous, exotic Singapore and confront Chinese pirate Captain Sao Feng to gain charts, and a ship, that will take them off to world's end, to rescue Jack. But even if Captain Jack is successfully rescued, the gathering of the legendary Brethren Court may not be enough to hold back the fearsome tide of Beckett, Davy Jones and their powerful Armada ... unless the capricious sea goddess Calypso, imprisoned in human form, can be freed and convinced to come to their aid. As betrayal piles upon betrayal, it becomes clear that Jack, Will, Elizabeth, Sao Feng, and Barbossa each have their own agenda, and no one can be trusted. Yet each must choose a side, and make their final alliances for one last battle, in a titanic showdown that could eliminate the freedom-loving pirates from the seven seas - forever.